I'm Jess and I'm a 27 year old primary school teacher. When I started this program I knew that I had to do something about my eating habits - I snacked and grazed out of comfort, boredom and habit. Despite exercising and eating what I thought were healthy enough meals I still couldn't lose the half a stone/stone that I wanted to - to be slimmer around the middle, improve my skin and general health. I have thoroughly enjoyed the overall energy boost that this program has helped me regain. I loved the new ideas for delicious wholesome and healthy foods which were simple and quick to make. The exercise sessions have challenged me but have been very rewarding physically and mentally- I have felt great, full of positive vibes and good endorphins which I find help you to stay motivated and focused. This program has taught me so much about nutrition but also so much about ways to make the best of life and live each day to the full. I have taken up my art practise again and I'm learning to play the ukulele these activities have helped me retrain my brain that I don't always need food for comfort/entertainment- I can do other things not just eat. The food that I ate in the 8 weeks I continue to eat now (with more awareness of portion size and variety) - this is the 'norm' for me now and I will continue everything from the 8 week boost from now onwards! I have learnt how to manage limits and still have fun out with food and drink with friends. 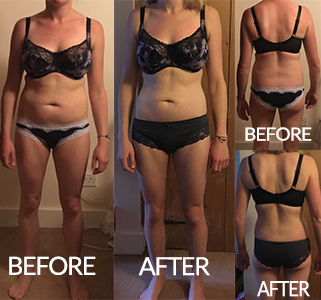 My results: after 8 weeks I have gone from a 'tight' 10/12 in jeans to an 8 and I lost 6cm off of my waist - which I am chuffed with! My fitness has improved- I can now do an extra 20 press ups in a minute, run as fast as I can around the block 30 seconds faster and hold the plank for over an extra minute! My skin is clearer and my symptoms of PCOS have basically gone away! Total CM's Lost 24cm altogether with 6cm off my tummy (which was my 'problem area') and down from size 12/10 to an 8! If you are reading this page thinking about starting your own journey then don't hesitate any longer - I absolutely 110% recommend Lorna's program! It will be one of the best decisions you make to take control of your health, future and body- you won't look back! My advice is be kind to yourself, you are worth so much and capable of much more than you think. Take this as a step forward into a manageable, realistic and brilliant positive change that I promise will leave you feeling amazing! Were you inspired by Jess's story? If so why not start your own journey?